TOGETHER they served on HMS Illustrious and together they celebrated receiving their medals. Friends Ian White, Jack Cant, Stan Stallard and Cliff Hardcastle spent Saturday reminiscing about their time on-board the aircraft carrier, as veterans of its 1982 personnel gathered at Portsmouth Guildhall to exchange memories. They were joined by Cliff’s son Tom who was on the last draft of HMS Illustrious before it was decommissioned last year. Cliff and Tom, from Southsea, enjoyed the reunion and Cliff said it was an honour to get the medal. The 51-year-old said: ‘It’s a real honour to get recognition for the time spent on Illustrious. He added: ‘It has been great to share with everyone being presented our medals because some of the guys I haven’t seen for 30 years. For Jack, who served as Lieutenant Commander on the ship, it was good see then captain Admiral Sir Jock Slater. The 76-year-old, from Dorset, said: ‘The whole day was a very good occasion and it was particularly nice to see Sir Jock. He added: ‘When we left Newcastle in 1982, it was extremely busy on the ship and there wasn’t any room for people to make mistakes. Stan, from Newcastle, agreed. He said: ‘I remember it being hectic on Illustrious and you hard to learn things quickly and then get on with it. LIVING more than 350 miles away makes it difficult for Abs Shirodkar and John Gibson to keep in touch. So the medal ceremony was the perfect opportunity for them to catch-up and remember their times on HMS Illustrious. Abs, who is from Portsmouth but recently moved to Newcastle, was not expecting to receive the South Atlantic Medal after 33 years since he served on the ship. 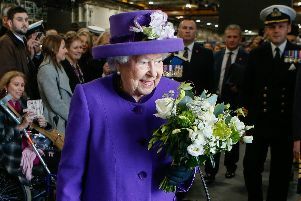 The 59-year-old said: ‘It was a real honour and something I didn’t expect. ‘Even without seeing everyone, the day was really special but having so many shipmates to celebrate with made it a great day.